There isn’t much to say about this office that the images don’t say themselves. Using furniture from Ikea, Ichirorabbit has created an amazingly well organized and highly functional shared office. 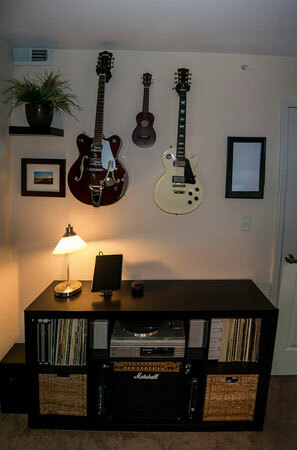 I also love the creative use of the floating shelves. This office is impressive on numerous levels. Thank you, Icirorabbit, for sharing your workspace with us. For anyone who’s met me, they know I’m a talker. And, a fast one, too, especially when I’m excited or nervous. The words seem to get bottled up behind my teeth and like bubbles in a shaken soda can, they try to burst out all at once. The result is usually that the person I’m talking to gets a perplexed look on his/her face and I’m asked to repeat myself (slowly, of course). Other emotions can take over, too. For instance, if I’m feeling particularly testy, it’s helpful to wait until I’m in more positive frame of mind before engaging me in conversations (whether in person, on the phone, or via email/text message). Controlling your emotions so that you can get down to the basics of what you want to say doesn’t have to be difficult, though. All you will likely need is a strategy or two, along with some practice, to help you communicate more clearly and keep conversations uncluttered. As I mentioned, when my nerves or enthusiasm get the best of me (or both at the same time! ), I know I need to take things a bit more slowly. If you make a point of focusing on how you’re feeling at specific times, you’ll be able to decipher which situations make you the most anxious (like public speaking or asking for a raise) so that you can come up with some strategies to remain calm and in control of what you say and how well you say it. If you have to opportunity to craft a message ahead of time (like when writing an email/letter or leaving a voice message), take it. You’ll be able to gather your thoughts and really think about what you want to say before your say it (even if you’re saying it electronically). This is especially true if you’re annoyed or angry. In those situations, it’s best to wait until you’re feeling more positive, as you run the risk of saying something that you may regret and are unable to retract if you type when you’re mad. … from your diaphram. When you’re feeling nervous and tense, diaphragmatic breathing allows you to take in more oxygen and helps you to relax. This is also a useful technique for the moments leading up to a group presentation, report, or interview. Taking deep breaths will give you some time to think rationally, to put things in perspective, and solidify your talking points. To get more comfortable with what you want to say, do a trial run, if possible. Say it out loud (and/or record yourself) to hear how you sound. Does your pitch increase or decrease drastically? Are you speaking too quickly or slowly? Does a nervous laugh pop up? Rehearsing can help you fine tune what you want to say in a natural way. It can also help to practice in front of a mirror or with a friend who can give you objective feedback and suggestions for improvement. Recording yourself and playing it back can also be helpful. You may feel pressured to respond to emails immediately, particularly if the sender indicates they need a quick reply. You could send multiple messages — one that says you received their email, another that actually shares the needed information, and a final follow up. Or, you could gather all the data you need before replying. This will save you some time and reduce inbox clutter. One way to reduce distractions when you’re on an important phone call is to turn off your call-waiting notification. Turning off call waiting is like turning off email notifications. Both tempt you to stop fully attending to the person you’re talking to, and can make you lose your train of thought (especially when you take your mobile phone from your ear to see who’s calling). Saying the right thing at the right time is important. But, rather than focusing on how poorly you may be feeling, turn your mood around by holding on to your sense of humor and focusing on solutions. Choose strategies that help you feel more comfortable so that you can communicate well. The less clutter you put out in your communications, typically the less clutter you receive in response. 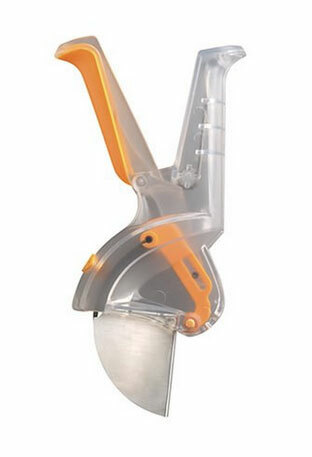 If you’re like me and have no idea how someone might use this device, let me direct you to a YouTube video demonstrating how to use the Chef’n Grapefruiter Citrus Sectioning Tool. Careful observation of this video will have you noticing the grapefruit had to first be cut in half with a knife. So, to use the Citrus Sectioning Tool you have to dirty it and a knife … a knife that could easily do the exact same thing. A knife that you already own. A knife that doesn’t have an extra –er tagged onto the end of it for some unknown reason — Grapefruiter? In case you’ve never sectioned a grapefruit (or orange or one of those cross-breed citrus fruits), check out this other YouTube video demonstrating the simple method I was taught as a child to section a grapefruit with a knife. And, you’ll notice in my preferred method, you can also julienne the sections and dice them and do more fancy things and not call the tool a knifer! I’m sure the unitasker does a nice job and sections grapefruiter exactly as it describes, but it’s one of those devices that only duplicates one of the thousands of actions you can easily perform with a knife. Finally, thanks to reader Jillian for bringing this device to our attention. Back in August 1995, hurricane Erin hit Florida. Erin may sound familiar to you because although she wasn’t an extremely powerful hurricane (at its strongest in the Gulf, it was only a Category 2), she had a lot of media attention for being the first hurricane to land in the U.S. after Andrew. Since hurricane Erin and I shared a name, I watched weather reports about the storm with great interest. I learned a lot about tropical cyclones and hurricanes from that news cycle, and have continued to learn more about these types of storms in the following years. With Isaac currently hitting US shores, I’ve become quite interested in learning about how hurricanes form — specifically, with learning how hurricanes organize. When talking about organizing physical possessions, you probably think about creating unified systems for storing items and making quick work of retrieving items from the system. Surprisingly, hurricanes also go through an organizing process when developing strength. Before becoming a hurricane, these weather systems are actually numerous thunderstorms coming off the African continent. When they group together and start swirling around each other, they become a tropical cyclone. And, finally, when they fully consolidate and organize is when they turn into a hurricane. The more organized the hurricane, the more powerful it is. Conversely, the less organized the storms within the hurricane, the less powerful it is. Obviously, hurricane formation is significantly more complicated than what I am explaining (air temperature, pressure, and other factors contribute to a hurricane’s strength), but this is the general idea. It’s as if numerous thunderstorms come together around a maypole, each taking a ribbon. If the storms move together as a unit at similar speeds around the maypole with equal distance from the maypole and maintain an orderly fashion, they will gain speed and strength and create a very powerful hurricane. If the individual thunderstorms move at different speeds and vary their distance from the maypole and bump into each other, they will be chaotic and lack speed and strength. One will look like a well-coordinated and vicious dance, while the other will look like a bunch of kids rough-housing on a playground. Neither scenario is safe, but the well-organized scenario is much more powerful and deadly because the strengths of all the thunderstorms are coordinating together. When creating organizing systems in your home and/or office, consider this concept of hurricane consolidation. A system that works in a coordinated effort and best meets your needs is going to be much more powerful and successful for you than a system with stray and wayward pieces that is haphazard and chaotic. Or, as we often say here on Unclutterer, when there is a place for everything and everything is in its place, you’ll have a simple time using and maintaining your organizing system. We receive a lot of offers to test products and write reviews for the site, and we almost always decline. Very rarely do the items look like they would actually be useful. A few weeks ago, however, we got an offer from the Martha Stewart company to try out their new dry erase boards that looked like they might be useful, so we agreed to give them a try. I received the new Martha Stewart Home Office with Avery Dry Erase Decals (free of cost from the manufacturer) to test out a few days later. Two of the key features are that they can stick to many surfaces (including walls, stainless steel, glass, and plastic) and they’re removable (and, therefore, can be repositioned as many times as you want). At first glance, they look like giant gift labels (about the size of a piece of notebook paper), but they’re really a bit more than that. They can be used to write reminders, to do lists, a grocery list, or even a fun, positive quote for the day. Since I really like to handwrite lists, I was curious to see how well they would work. I decided to use one of the decals for a task list and placed it in a location that was very visible (so that I would be reminded to use it) — on the glass window of the main entry door to our house. This was the perfect spot for me as I often remind myself to take things when I’m leaving home by putting them by that door. 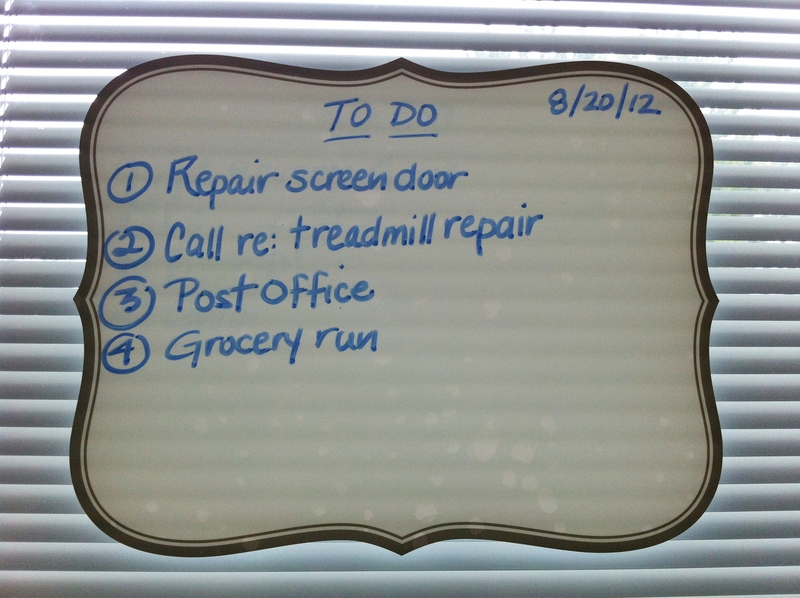 To remember everything on my list, all I had to do was snap a picture of it before heading out to run errands. I used the other label on the wall adjacent to my daughter’s room door. This time, I wrote down books I wanted to remember to buy for her. It could be used by older children (or their parents) to jot down updates to their schedule (like a change to an extracurricular event). Or, you could write the instructions for a new recipe or a note to call a client at a certain time. Perhaps you need a visual nudge that says, “Work on important project today!” (that could work well if the decal is placed by your workspace) or a happy face to help you get through an eventful day. The decals were very easy to apply to both the glass window and wall, and I had no problem removing or repositioning them on either surface. It didn’t leave a residue or take off wall paint. The writing surface is very smooth and erasing was just as easy as using a typical dry erase board. 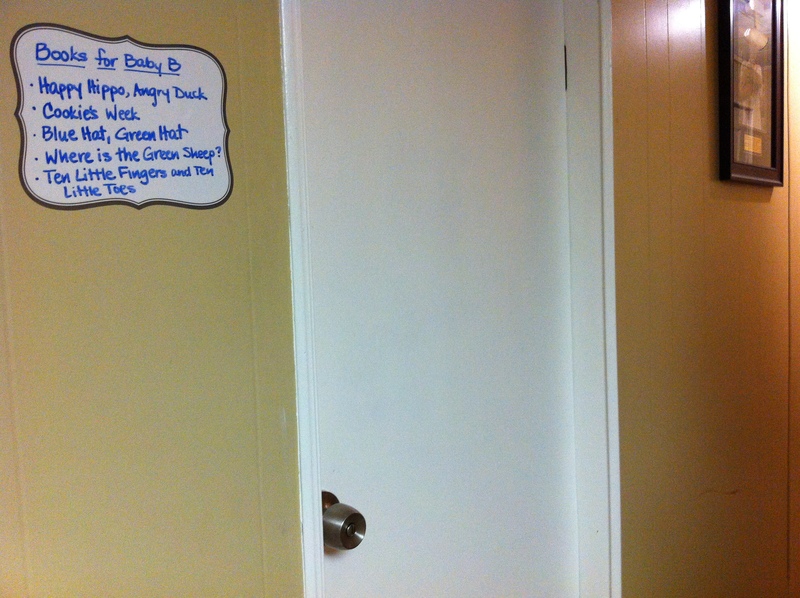 They work well for capturing ideas and reminders, though you will need dry erase markers close by. I will be continuing to test the decals in my home office (to write future blog topics) as well as on the fridge (to write a grocery list). They seem to be a nice solution for someone living in an apartment with restrictions on nailing things into the wall. If you want to give them a try for your home, office, or dorm room, you can find them on Amazon and at Staples. They cost in the $3 to $5 price range and come in a variety of styles, which is relatively inexpensive especially in comparison to most traditional dry erase boards. I am having trouble letting go of my old worn out and resewn Pound Puppy stuffed animal that I have been told to cut up and burn due to allergies and asthma. What should I do with it now that I am thirty eight years old? I think most of us have a favorite item from our childhood that has traveled the years into our adult lives. For me, it’s a small pillow I got when I moved into my big-girl bed. My husband has a stuffed animal that is missing an arm. My cousin has the tattered remains of a blue gingham blanket. These items provided comfort to us when we were scared or lonely or simply needed another guest at our tea parties. As long as you don’t have a menagerie of these items taking up unnecessary space in your home, I see no harm in keeping your single favorite comfort item from your childhood. However, there are ways to keep the item without upsetting your allergies or asthma. It’s more expensive then you might expect, but you can send your Pound Puppy to a stuffed animal repair hospital to be cleaned, restuffed, and repaired. Your Pound Puppy will look different, though, when it emerges from the hospital, so only go this route if you’re okay with your stuffed animal looking like new again. (My mother-in-law had my sister-in-law’s favorite doll repaired after some hair loss, and my sister-in-law was so traumatized she never touched the doll again.) Most importantly, after a makeover at the stuffed animal repair hospital, you should be able to keep and snuggle with your comfort item without having an allergic reaction. If a restoration isn’t for you, I recommend retiring your comfort item to a display box. This way, you can still look at and admire your stuffed animal, but the dander on it will no longer upset your allergies and asthma. Before putting it into the display box, you may want to first have your Pound Puppy cleaned at a stuffed animal repair shop so the mites on the item don’t continue to feast on it. But, in this case, I wouldn’t go for the full-body makeover, just a cleaning. If displaying your stuffed animal isn’t a priority, you may want to get an archival box to store your item in for the longterm. Again, you’ll likely want to have the item cleaned before going into storage. Once in the archival box, you can place it in a plastic bin to keep other pests from invading your cherished friend. Clutter is anything that gets in the way of the life you want to live. In this case, I think the mites and dander on the Pound Puppy are the problem, not the Pound Puppy. I also think that if you got rid of the comfort item entirely, you’d likely spend a significant amount of time regretting your decision and having that regret clutter up your thoughts. Thank you, Emily, for submitting your question for our Ask Unclutterer column. Please check the comment section for even more ideas from our readers. “Weren’t computers supposed to make our lives easier?” How often have you heard that question in a sarcastic or exasperated tone? The answer is simple, but unexpected. First of all, yes, computers are meant to make our lives easier. But, the reason it often seems they don’t is because computers are dumb. That is to say, they are machines and can only do what we tell time to do. That can be a hindrance, such as when you can’t figure out the steps necessary to accomplish a task. But it’s also out greatest asset, especially when the steps are simple, clear and effective. One of the best examples I can think of is automation, and my favorite automation tool is something called IFTTT. If [this happens], then [do this other thing]. A new screen appears with “ifthisthenthat” in bold letters. Note that “this” is a link. Click it. Time to pick step one! This is the “thing” that must happen in order for step two to take place. Click “Facebook,” and give IFTTT permission to access it. Choose your Trigger. This is the thing Facebook must “do” in order to trigger step two. In this example, I choose “you upload a new photo.” Click Create Trigger to confirm. Choose your action from the grid. In our case, Evernote. Finally, click “create action,” confirm that you see “if [Facebook] then [Evernote]”, click “create recipe” and you’re done! Now, every time I post a photo to Facebook, it’s added to my Evernote account. It doesn’t matter if I use my phone, computer or camera. Off the image goes to Evernote, saving me time. Send an email message to Evernote. Get updates on what’s new on Netflix. Receive the day’s weather forecast as a text message. Receive an email if it’s going to rain, reminding you to pack an umbrella. Send starred RSS items to Evernote or Pocket for later reading. It goes on and on. There’s so much you can do, from receiving or sending reminders, watching certain feeds for changes or, my favorite, completing mundane and time-consuming tasks automatically. Create an IFTTT account, start cooking recipes and see what you can do. Today’s Unitasker Wednesday post is a post you won’t want to miss. In this very special episode, or, uh, very special post, we’ll explore the serious issue of fingernail polish smudges. This post diverges from our regular unitaskery tone, and parental discretion is advised. Do you sometimes smudge your nail polish after you paint your fingernails? When you smudge your polish, do you experience physical pain or significant financial burden? Even though you just painted your nails, are you somehow rendered incapable of touching up the smudge because of a phobia or a deal you made with your grandmother on her deathbed where you promised to never touch up smudged nails? Do you have a compulsion with smudging up your nail polish when it’s wet and feel you are out of control? 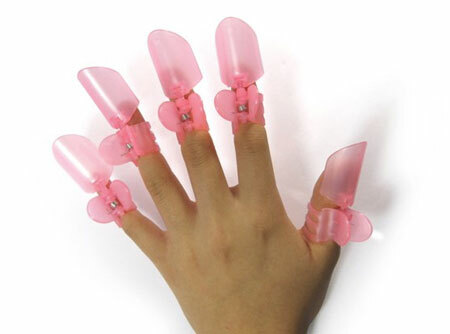 Do you long to look completely ridiculous after you paint your fingernails? So, the moral of this very special post (all very special posts have moral lessons) is to stop inhaling nail polish fumes or something equally important and very valuable. Whatever the lesson, you should talk it over with your parents or call a hotline or learn more from your local library. Oh yes, you should definitely go to your local library to learn more about the serious issue of nail polish smudges. Thanks to reader Magic for submitting this very special unitasker to us. It was very special. Today is National S’mores Day … so we must feature even s’more unitaskers! This week’s Workspace of the Week is JoyMystic’s beautifully wired desk. Reader Katie is looking for a way to keep her jewelry organized when she travels. My friend and professional organizer Julie Bestry recently headed to Office Depot to see what is new in the back-to-school supplies section. Her recap of the adventure introduced me to two new types of organizing products I wanted to pass along to you. I think my favorite part about this unitasker is how it mentions an alternative multitasking object that can do the job just as well in the product’s name. The name of the product reminds you about a knife! A knife you already own! A knife that makes this product completely unnecessary! Ask Unclutterer: Trash or treasure old stuffed animals? Reader Kay wants to know what she should do with all of her old stuffed animals that have been in storage for decades in cardboard boxes in her basement. Regardless of if you have read or your opinion of Elizabeth Gilbert’s book Eat, Pray, Love and the recently released movie of the same name, the show Marketplace on National Public Radio had a very poignant piece this Friday about the business, marketing, and branding of simplification and uncluttering. Does uncluttered have to mean symmetrical? When organizing and decorating your spaces, do you tend toward symmetry in design or do you seek out the one item that pleases you the most? Since we talk about office organizing quite a bit on Unclutterer, I thought it might be fun to instead let the magazine’s editor, Dan Schawbel, talk to us about a topic he knows in great detail and one that we rarely discuss on the site — personal branding. With the Kool Dogz Ice Treat Maker a dog owner can now make a huge ice block for their pooch with this six piece ice making set up. Unclutterer interviews Julie Morgenstern about her latest book. Having to lug a car seat and stroller through the airport isn’t a very fun experience. I’m sure our readers have many differing opinions on what the best hanger is, but I’ll highlight a few options. When mind clutter takes over your thoughts, what can you do to gain control and refocus? Managing paper is often a reason I’m called in to help clients. They are usually frustrated by growing paper piles and, almost always, there is a Miscellaneous (MISC) file among the piles. The MISC file is like a junk drawer for a diverse set of papers they’re not sure how to process. When files are labeled MISC, it’s difficult to figure out (and find) what is inside because the label is broad and encompasses several categories. This will ultimately slow you down when you need to retrieve information, and on days when things are hectic and particularly fast-paced, you can quickly get frustrated. So, why are MISC files created so often? Perhaps because it’s easier to put everything in one general file than making more complex decisions. Figuring out what to do takes time and some decision making, like what to keep and what to recycle/shred, what categories to use, and making room for new items. To banish that catch-all file and make deciding what to do a little easier, follow these steps. Of course, not every system will work for everyone, but this three-step process will at least get you thinking about creating one that will work for you. Ask yourself a few questions. Before you decide where to put a specific piece of paper, decide if you actually need that piece of paper. Can you access it in some other way (internet, a digital scanned copy)? How long has it been since you last referred to that document? Does the responsibility of storing it still lie with you or does it now belong to someone else or another department? The names you use will be particular to you and the typical documents you need to keep. Also, consider looking at your existing categories to see if you can find the right match for your papers (then you wouldn’t have to make a new folder or come up with a new category at all). Use easy-to-remember categories. Putting things in categories actually helps us to remember those items better. This means you’ll be more efficient at finding the files you want when they are grouped by a specific topic that makes sense to you. For instance, you might have a Utilities category in which you put the current telephone, gas, electric, and water bills. Or, a “Blogging” folder for articles that inspire your future posts. You can really simplify the filing process by removing your MISC folder from your paper filing system. You’ll find that there really isn’t a need for a general file once you have determined the correct category for your papers. And, keep in mind, the less you print, the less you have to file and retrieve. When possible, use online bookmarking tools (like Delicious and Instapaper) and/or tag your documents and save them to your hard drive and/or cloud server so you can find them easily.